IEA recognises the critical need for continuous exposures and interactions for entrepreneurs to become an excellent leader in the business world. For this to become successful, IEA realised that the development effort should start from a younger age and continuously enhanced over a long period of time. That is the reason for the setting up of Youth Chapter (YC) and Adult Chapter (AC) which is created specifically to provide all entrepreneurs a platform through a well-established networking system under IEA to share information, learning from each other and explore every possible business opportunities. Upon becoming IEA’s member, entrepreneurs and potential entrepreneurs should enjoy plenty of opportunities in getting involved into all activities organised and run by IEA and all its business alliances worldwide. YC which is directly managed by IEA where it encourages young graduates that are currently still pursuing their college diplomas or university’s degrees to actively engage into activities initiated by IEA, such as entrepreneurship conferences; business study tour; specially organised talks, workshops or seminars. AC is another important part of IEA which gathers all working adults who has strong interest in entrepreneurship to jointly work together to share business contacts, create new ideas, setting up new ventures as well as tapping new business opportunities. IEA believes that continuous learning through attending workshops, conference and training programmes will greatly enhance an entrepreneur’s abilities to remain competitive and to continue to excel in their business or work. IEA has been actively offering its professional training programmes to numerous corporations for the purpose of skills upgrading for staffs and long-term internal human resource development. These training activities are conducted either at the client’s premise or at established hotel’s training rooms. Key trainers and speakers for such training sessions are professionals from various industries who possess years of experience and are experts within the chosen field. This is to ensure participants attended the training session to acquire the necessary knowledge and skills which can be immediately applied into their respective workplace or business. Training programmes are normally either custom-made or according to the standard training modules required by corporations. These training programmes range from 1-day to 6-days training. To evaluate and accept educational courses from various training centres, college and universities to earn credits points in the process of acquiring the prestigious IEA diplomas. To offer IEA diploma, graduate diploma and postgraduate diploma holders a path into universities for further study. IEA has developed an interestingly unique system where it is able to validate and make credit-transfer a possible move to transfer students from one programme to another, subject to the reason and objective of the student’s need. This effort is made possible due to IEA’s extensive network and contact with other reputable educational institutions from around the world. IEA is also enthusiastic in developing, promoting and providing quality education programmes to all its members, business partners, strategic alliances and any educational institutions. The system created by IEA is unique in nature and it serves the purpose of educating any one who aspires to learn, not restricted by factors such as gender, age, race or nationality. 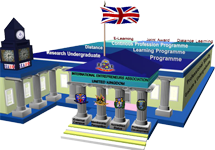 The professional programmes that come with qualifications can be divided into four levels, namely: Diploma, Advanced Diploma, Graduate Diploma and Post-Graduate Diploma. All diplomas allow graduates to gain access into a host of universities or colleges from different countries and different disciplines for continuous study such as undergraduate degrees and postgraduate degrees. For further information, please refers to Undergraduate Route.